Over the years, augmented reality and mobile gaming have proven to be a surprisingly harmonious combination. Pokémon Go showed us that AR can be more than a neat party trick. Angry Birds AR: Isle of Pigs, the next entry in Resolution Games’ puzzle series, continues that trend. I had a few minutes to preview the game on the iPhone XS Max. It had all the marks of a signature Angry Birds experience — the same disgruntled fowls, increasingly difficult levels with collapsible structures, and evil little piggies that need to be eliminated. 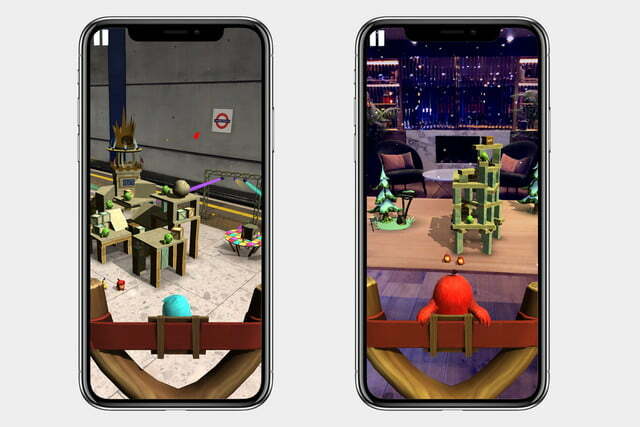 While your typical Angry Birds game challenges you to tackle puzzles in 2D, playing it using AR adds a layer of depth and dimension to the gameplay. Literally — this is the usual Angry Birds experience translated to 3D, and the addition of AR compliments the gameplay well. You won’t be jumping straight into the action in Angry Birds AR: Isle of Pigs. It requires a tiny bit of time to calibrate so it can work with your surroundings. Just like Pokémon Go, you’ll be playing the game with the space around you serving as a backdrop. You’ll be asked to set the miniature level on a flat surface in front of you. Once settled, the game will start, and if you’ve ever played Angry Birds then it’ll all be very familiar. You slingshot birds with explosive capabilities at shoddy buildings and squish the pigs. The slingshot is set up along the bottom of the screen, and once your feathered friend is placed inside, you’ll pull back on it while moving your phone to adjust the distance, power, and angle of your shot. Isle of Pigs still shows the trajectory of your shot just like the previous games, and you can walk around (or use your finger to turn) each 3D structure to help plan your next attack. This option is nice as it gives you the ability to turn it into a stationary experience, or one where you can move around. Pigs, chests, and more can be found inside, on, and around structures, so being able to adjust and shoot from any perspective helps tackle those particular challenges. This is the way Angry Birds was meant to be played from the start. The levels also environmental themes change the atmosphere of the room on your mobile device. We played a winter-inspired level that added an icy blue hue with snowflakes that fell slowly throughout. In another, a music concert could be seen in the background as it flashed colorful lights and rainbow confetti fell down all around. Unfortunately, the version of the game we played didn’t have audio yet, so in that regard, it was slightly lacking. Even so, Angry Birds AR: Isle of Pigs feels like a natural progression for the series. The simple mechanics of shooting and demolishing buildings don’t feel like a gimmick. It feels like this is the way Angry Birds was meant to be played from the start. If you enjoy any of the Angry Birds games, you’ll probably find Isle of Pigs is an authentic and fresh take on the series. 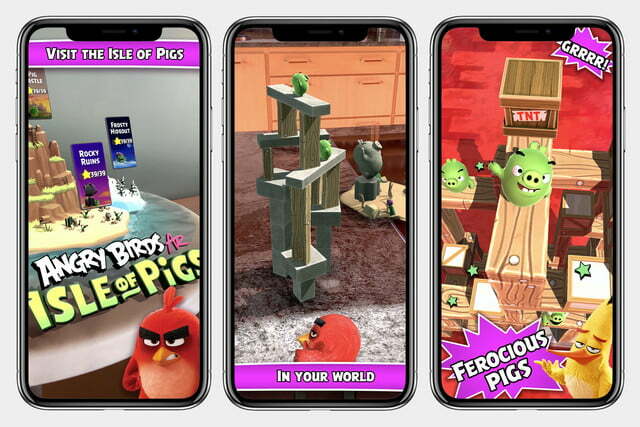 Starting March 19, the Apple App Store will be taking pre-orders of Angry Birds AR: Isle of Pigs with a launch date sometime in Spring 2019. The game will be free-to-play and may release at a later date for other AR supported devices.